I'd like to see if I'm the only one who had such an experience or if this is commonplace? If there is any way that SO can approach Pluralsight directly about it and fix the tests? Honestly I don't mind my score one bit (it wouldn't matter for job performance or hiring anyway) but I'm very concerned about the negative experience new programmers might have - we do a lot to be nice(ish) in Stack Overflow and I'm very dissatisfied with the user experience. Every object created by a constructor has an implicit reference (called the object’s prototype) to the value of its constructor’s “prototype” property. Furthermore, a prototype may have a non-null implicit reference to its prototype, and so on; this is called the prototype chain. Now, eventually I started to figure out "what they were aiming for" and answered incorrect questions correctly (meaning incorrectly) which I think undermines the whole premise. Your experience is not isolated. In the C++ exam I encountered one question that was outright wrong and a second that was wrong for the latest C++ standard (one answer was right in an old standard, the other 3 were wrong in all versions). In the C# exam I didn't find any where the "correct" answer was unambiguously wrong, but a handful had ambiguous/misleading wording such that multiple answers should have been accepted. The post-quiz review was pretty pointless because it didn't provide any explanation or citation of the specification, just the list of answers with the preferred one highlighted. But there was a "Feedback" link there which allowed reporting bad Q&As. Since I submitted feedback recently, I have no idea whether they will let me know when they make a decision, or if indeed they read the feedback at all. My experience is not much better. I found most C++ questions low quality or irrelevant (details of C++ stream formatting - why should anyone bother remembering those?). The questions seem more like a fun quiz about programming language / libraries quirks than an assessment of skills. Add to this the fact they do not support international characters in the user names, but they happily accept them when I write them and produce a garbled results - is the year really 2018? Overall I find the experience with PluralSight IQ very unsatisfactory and I am surprised StackOverflow promotes this or even wants to be associated with this. If you want a live NodeList, which selection method would you use? Now, querySelectorAll does return a NodeList, but it specifically returns a non-live NodeList, while queryselector returns the first element that matches the selector, so not a NodeList at all, and the last two options don't exist. I picked one of the ones that didn't exist at random because... what the hell, why not, right? They're all wrong anyways, and I knew they wanted me to pick querySelectorAll even though doing so would be incorrect. First, a distinction between instances of the NodeList interface and instances of the HTMLCollection interface. A collection is an object that represents a list of nodes. A collection can be either live or static. Unless otherwise stated, a collection must be live. However, the NodeList and HTMLCollection interfaces are distinct, even though they are both array-like objects that contain nodes. The first option isn't useful for selecting elements per se, as it is only accessible on instances of the Node interface, and contains all of that elements children. The second option would require the use of a name attribute on the elements, and is only available on instances of the Document interface, so you cannot limit the context, and as such is less than ideal. Both are much more versatile than the previous methods for a variety of reasons, but still it is very rare to need a live collection of nodes or elements, and there are usually better ways to accomplish the task. I flagged the question in question, as well as the other questions that were incorrect. I have not received a follow-up as of yet. Which of these is NOT a type of Error? This question has an incorrect answer. InternalError is also not defined in browsers or defined the ECMAScript specification, and so should also be a valid answer. Which is the proper way to do prototypal inheritance? 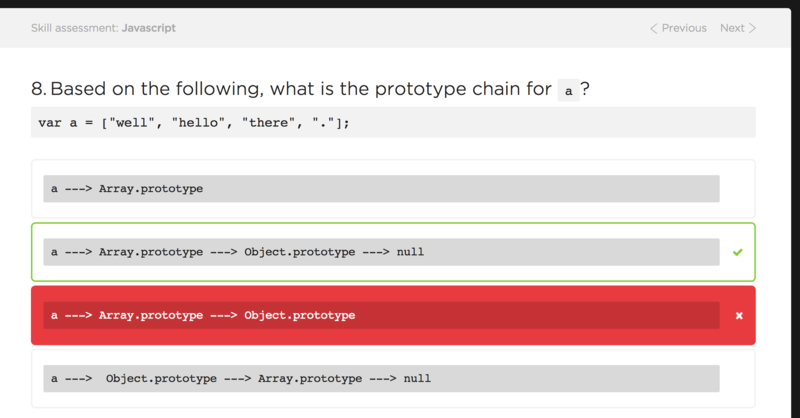 To the extent that this was ever a correct answer, that ended in ES5 (published in 2009) with the addition of Object.create(), which is a cleaner way to set up a prototype. But even prior to that, a general solution to setting up prototypical inheritance requires this dummy constructor dance, which Pluralsight does not provide as an option. How do you remove an object from the global scope? You can't remove an object from the global scope. Memory management will remove it automatically if not referenced. This question has ambiguous/incorrect wording. The question doesn't ask "how do you remove a binding", or "a variable", or "an assignment" from the global scope, it asks how you remove "an object". And you could indeed detach "an object" from the global scope by "2. Assigning it to null" and then "3. Memory management will remove it automatically if not referenced". Pluralsight IQ is roughly linearly-distributed. Traditional IQ is roughly normally-distributed. I just took a whole-bunch-o-tests on Pluralsight. There is a feedback button in the bottom left of all questions. You're not alone. I used that feedback button on about 50% of the questions. Node.js test was ridiculous. Passport.js, Sinon, and Mocha are not standard Node.js and have nothing to do with Node.js proficiency. I've only ever used Mocha and found it stressful that ~40% of the questions had to do with these niche, specific packages. C++ test used an egregious amount of trickery and had a few "correct" answers that were actually incorrect or undefined behavior based on the standards. Also, some of the answers could have been different if you took compiler optimizations into account (which, if you've ever perused the C++ tag here on SO, you should usually take into account). Hacking and Security test was okay, though very disassembly oriented. No complaints there, really, but it did also have quite a few framework/commercial service related questions that I don't think many people would know (had nothing to do with skill or fundamentals - one of the questions was literally about a specific fuzzing service that fuzzed "Microsof" (misspelled) document formats). As well, it implied that modern string detection utilities couldn't reason about wide characters or even unicode, which is laughable (I believe the answer they wanted was Most tools have problems detecting wide character strings and can only detect ASCII. which is blatantly false). I also wish they specified which flavor the assembly was in (GAS vs NASM, etc.) since one of the questions' answers would have been different if the mov instruction's operands were reversed (which is the case with certain dialects). Java was almost exclusively about Java 8 streams. I understand why, and I understand that they are used, but nobody uses streams that much. As well, some of the questions were extremely poorly worded and intentionally confusing. Docker test was bizarre. A few questions asked about things that made absolutely no sense and that I couldn't even begin to search because the question was so convoluted and vague and the answers were generic and unhelpful. They kept asking the same thing over and over and implied that several bad practices were in fact good practices. Python test was similar to Node.js in that it asked about a lot of third-party modules that weren't standard to Python and had nothing to do with the language, standard or surrounding official ecosystem. Very frustrating. What really bothers me are the questions that are intentionally tricky just for the sake of throwing the test-taker off. Here I thought I was being tested for proficiency but some of the questions just wanted to be dicks about test taking specifically. I have mild dyslexia so the question about What is the equivalent of (isTrue && isAlsoTrue) being ! (!isTrue || !isAlsoTrue) in the not-so-dyslexia-friendly font they used with a super lower timer was incredibly disheartening. Anyway, I just hit "give feedback" for every little thing I found. All I can do it hope the next person doesn't see those issues :P Maybe, if they're nice enough, they'll pardon some of the ones we got wrong because of the technical inaccuracies of the questions/answers. I was also in the JS chat while we were talking about the questions and reviewing the "wrongness" of it all. I was in an overly sassy mood, and decided to reach out to them on twitter. Their marketing team at least seems open to discussing the correctness of their assessments, though that doesn't mean all that much. 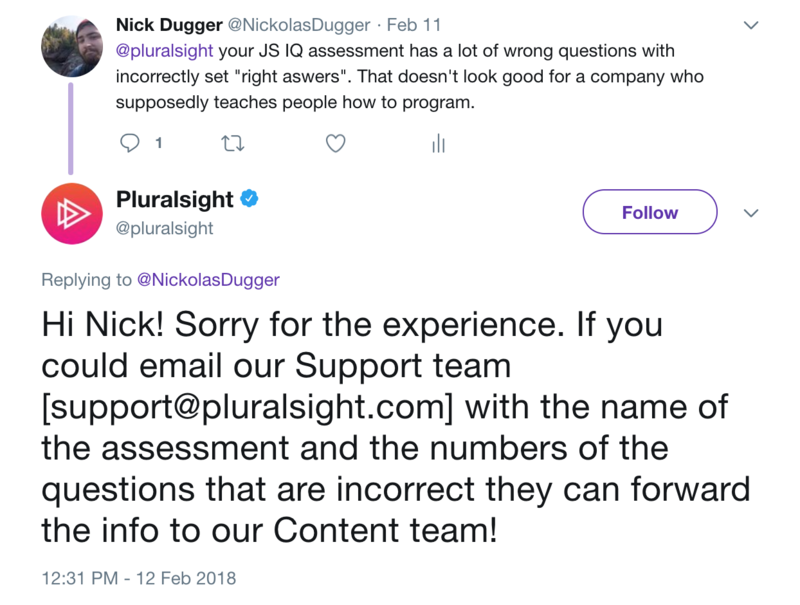 If you do so feel inclined to reach out they did say to send the assessment of their assessments to support@pluralsight.com, though at this point, I think this problem is a bit deeper than a simple email will solve. It seems like they need to completely redo most of their IQ assessments. I took the test on Microsoft Office 2016 as I've done a lot of VBA programming and know Access in and out. But who's an expert in the full range of applications in Office? First run I scored low as I know only little about Delve, Project, and Visio. One question in Access had no right answer to pick - it suggested to delete records where the correct method would be to filter them out. Second run I scored 96% even though no questions were about Access. This whole setup with PluralSight is below the standard of SO and should be taken under careful reconsideration by the powers that be, until PluralSight manages to bring this to a professional level. I'm one of the developers at Pluralsight who works on this feature. Thank you for all the feedback, we really appreciate it! We're always iterating and trying to improve our tools and the feedback here is helpful. I wanted to share some background/context on the questions that are presented within an assessment. The questions are created, in large part, by our course authors who are practitioners in the relevant language or technology. Each assessment is designed to cover the depth and breadth of knowledge within a skill area. We update and tweak the assessment questions all the time so this discussion is informative. In addition, the question weighting also changes dynamically within each assessment as its being taken, based on how the question is answered, e.g. answering a series of questions incorrectly surface easier questions, correctly answering questions surface more challenging questions, etc. We have team members who are logging the feedback in this thread and will review it thoroughly, specifically about the questions and the assessments referenced here. 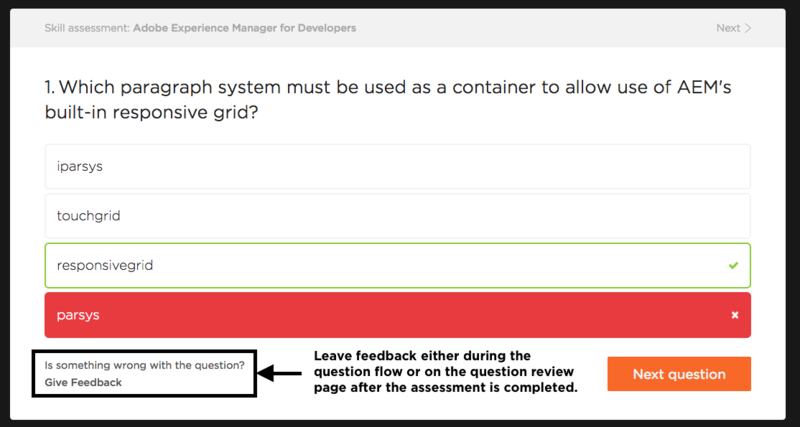 Also, as you take an assessment, you can leave feedback directly on the questions within the testing interface (for reference, see image below). So if you come across a question you think needs refinement, please don't hesitate to let us know using that tool! We love all the feedback that folks are leaving on the questions within the assessments—please keep it coming! We see it, and we're working on addressing it, and we're also working to improving how your feedback gets to us. You can also send comments and feedback to support@pluralsight.com, which will ensure that you hear back from someone on our support team. Thanks again for your interest in assessments! It seemed really Java8 / stream heavy. Perhaps it was just random chance, and sure, I like streams as well. From the content of the test though it felt very much like a Java 7 -> Java 8 certification update, with a few generic questions thrown in between. What's the difference between an inner class and a nested class? Who cares? It feels like a "I pulled this from Google therefore it's relevant" style question, with no real-world use. Anyone referring to these when talking to another developer is going to clarify whether the inner class is static anyway (if that's relevant to the conversation), so I'm not sure how this question tests proficiency in Java at all. It's analogous to the typo-style questions that put a lower case L at the end of a number to try to get you to think it's being declared as, say 51 rather than 5. There was at least a vaguely correct answer (that they're used interchangeably) given as an option, which was then marked wrong. Nested classes are divided into two categories: static and non-static. Nested classes that are declared static are called static nested classes. Non-static nested classes are called inner classes. My working theory (which may be wrong of course) is that the question was meant to read "What's the difference between an inner class and a static nested class", but was changed as that would've given the game away... Unfortunately, that change then made the question totally wrong. Not the answer you're looking for? Browse other questions tagged discussion developer-story pluralsight-iq . What is Pluralsight IQ and why does it show on my Developer Story? Can Pluralsight milestones be displayed in a different way (without imgur)? Is any link established between Pluralsight/Stack Overflow accounts?